It was Mother’s Day back in the UK, and I was fancying a treat. Somewhere I hadn’t been in a while definitely appealed, and Knaresborough fit the bill very nicely. This North Yorkshire market town lies on the River Nidd, and an iconic railway viaduct carries passengers into town, high above the river. Even on a rather murky English day, it’s a splendid sight. We parked just off the A59, on the edge of town, and strolled towards the centre. Almost immediately we become aware of one of the quirkier aspects of Knaresborough, the painted trompe l’oeuil windows that adorn many of the buildings. Town Windows illustrate characters and events from the town’s long history, and you can download the guide to find them all. Many of the Georgian buildings were designed with blank windows, to avoid paying window tax. The town has no shortage of interesting characters, two of them sitting side by side on benches in Market Square. Sculptures, of course! Ursula Southeil, a medieval seer, was known as Mother Shipton, and was said to have been born in a cave south of the town. ‘Blind Jack’, or John Metcalf, lost his sight following smallpox in childhood, but that did not prevent him going on to become an accomplished violin player, and later a pioneering road builder. I followed my nose into Green Dragon Yard, in search of tearooms, but was immediately distracted by the artwork. ‘Art in the Mill’ is a contemporary gallery situated in a former flax mill. The manufacture of linen was a cottage industry in Knaresborough, and flax was combed by hand in the mill, which dates from 1808. Castle ruins with a mighty history next. Built in 1100 by a Norman baron, Hugh de Moreville sought refuge there in the 1170s, after assassinating Thomas Becket. 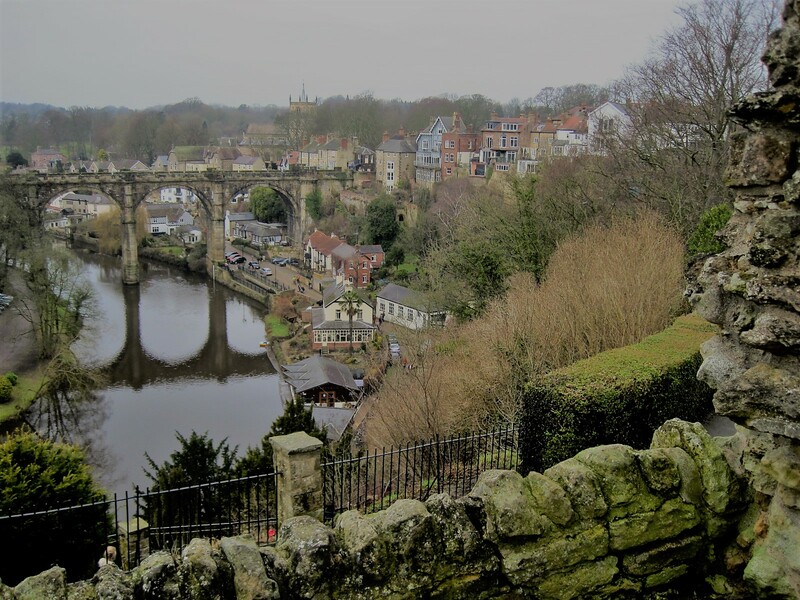 In 1205 King John invested considerable money strengthening the castle, to use as a hunting base for Knaresborough Forest. It was here that the first Royal Maundy took place, on 5th April, 1210, with the giving of alms to 13 poor men. Extensions and rebuilding, including the Keep, were completed by the King Edwards. The castle survived intact until 1648. It was taken by Parliamentarian troops in 1644, during the Civil War, and was largely destroyed by them, as a Royalist stronghold, by decree of Parliament. Admission details here. It’s in a wonderful situation, looking down onto the viaduct and the weir. Most of the town is at this upper level, steps leading down through gardens to the riverside, far below. Our intention was to follow the river beneath the overhanging cliffs, find the Chapel of Our Lady of the Crag, and then to cross over to the far shore. As it happened the chapel wasn’t open, but it’s a pleasant wander, with the river meandering below. There was a house or two that might have suited, though probably not the fortified House in the Rock. A text message disrupted further progress. Might we be heading to Leeds, half an hour away, where our son was happy to be included in the Mother’s Day celebrations? What else do you do when your grown up offspring has time to spend with you? The other bank of the river would certainly keep for another day. But first, a scone for sustenance. Honey Bees at Hannah’s, on Castlegate- simply scrumptious! And a few more murals. They’re great, aren’t they? I hope to get back to Knaresbrough in the Summer, and show you Mother Shipton’s Cave. For now, we’ll pop the kettle on and settle in for a good read. Please find a little time to visit these, especially if it’s somebody you don’t know. Many thanks to all you lovely contributors and patient readers. Anyone can join in. Just see my Jo’s Monday walk page for details. It takes more than a bit of Scottish weather to put Anabel off a lovely jaunt out! Candy shares beautiful images of nature in the north of Portugal. And there’s cake! How to open a pomegranate! You never know when you might need this. Thanks, Jackie! Truly exotic and stunningly beautiful photography- don’t miss Aarti! I know there are rather a lot this week, but they’re great reading! I may have to take my laptop into the garden, if the weather matches up to the forecast. Hooray! Make the most of it!